Just like our Pinfish and Bait Pens are Crab Traps are handmade for quality, performance and durability. 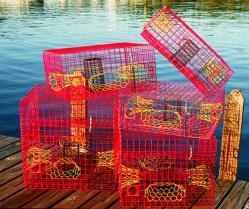 At first look our Crab Traps look similar to others on the market. Upon closer review you will notice the quality components used in construction and the increased number of components to insure the best durability possible. We use only the finest stainless steel rings to make connection points and over-sized rings for hinging our door and bait container areas. The bends of the wire are smooth and precise to insure structural integrity and even the color of the wire was extensively researched to find thebest combinations for maximizing your catch. Our Crab Traps are built for maximum results and are not made of cheap materials that fall apart after a few uses. We do not build these traps as cheap as we can and our customers appreciate that. All Crab Traps are built to the requirements of Florida Law and the requirement of 2 3/8” escape rings. Please check with your state law requirements for compliance.